Why 7.5X8 Magnets are Perceived as a Suitable Replacement for Many Professional Print Advertising Materials? Today, marketers understand the need of creating differentiation. They know that people always like fresh promotional concepts and they strongly despise copycat ideas. This is why they are slowly gelling up to the idea of magnet advertising because it allows them to be creative and different. 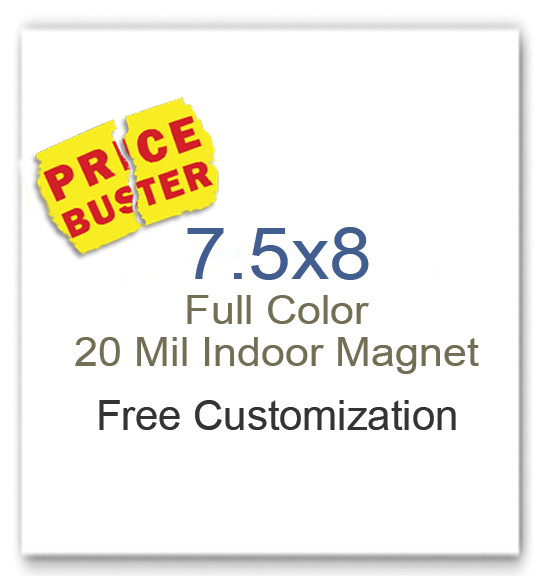 Over the years, many promotional rectangle and square magnets have gotten popular and 7.5 x8 magnets are one of them. Here is why they are perceived as a suitable replacement for many professional print advertising materials. Imagine two situations – a 7.5x 8 promotional flyer magnet and its replica on cheap quality paper of the same size. Even if the printed matter is same, people may not take the latter seriously. Do you know why? Because it is printed on a low quality and cheaper paper, which is not at all impressive. However, they will start thinking differently, when you offer them customized 8 x7.5 magnets. They would be impressed by its largeness, and make it a point to retain it over refrigerator doors or car doors as long as they can. Free full color printing makes customized magnets desirable. This means marketers can fiddle around with as many colors as they wish without worrying about escalating printing charges. This feature is perfect for small businesses and marketers who lack confidence about building strong campaigns! Many marketing experts also term free full color printing as the best thing for bringing out the inner Monet in you. Imagine a marketer approaching a printer for producing marketing materials. They would be asked to choose from existing templates and minimize their data to fit into them. However it is the reverse with magnet advertising because it allows marketers to take care of their campaign at their own pace. These large personalized magnets offer big space for experimentation and expression. No wonder, many marketers are seeking 7.5 x 8 magnets for building calendars, sales flyers, fundraiser magnets and more. They are proudly handing these full color rectangle custom magnets during tradeshows and other big marketing events. Although a promotional item printed over 7.5 x8 inch paper seems an affordable option than a same size magnet, but it may not offer a great service life. Customized magnets offer long-term exposure over one time investment. Cheaper paper marketing materials are low cost items and people may not take them seriously. However, full color marketing magnets would grab prominent positioning over refrigerator doors or car doors, wherever they are fixed. By now you might have understood, why 8 x7.5 magnets become suitable replacement for customized paper marketing materials of the same size. Another great advantage is that magnet advertising offers you free branding. This means you do not have to pay for full color printing, art setup, shipping and online design proof because they are offered free at many online stores stocking them.